Measures of land are quantities of length and surface. Any surface measure is predicated on the chosen measure of length; just as the volume measure is a resultant of any given system’s unit of length. The land measurement system revealed thus far is based on the “foot”, its subdivisions, and multiples. But, with the advent of the French Revolution in the 1790’s came an entirely new system of weights and measures. I believe its true intent was to usurp and obliterate from memory the very measures still in use today throughout America; measures which our European ancestors, for reasons long lost even to them, regarded as “sacred”. This “new” system of measurement is based on a length measure known as the “meter”; and the system itself they called “metric”. Amidst one of the bloodiest revolutions the world has ever seen, the French allege they commissioned a scientific survey to measure the distance from the North Pole to the equator, passing through Paris. This measurement was divided into 10,000,000 parts; one of these parts is a “meter”. It is my contention that the French never made that, or any other measurement resulting in the meter. That it was, in fact, just another “story” told to “the people”. And what was the motive? Same as for the stories “they” concocted to conceal from humanity the true origins of their ounces, gallons, inches, acres, and all increments thereof. That story was, and is still to this day, for the expressed purpose of continuing to conceal the greatest hoax ever perpetrated upon humanity! “Metric” is not only part of the hoax, it is part of the scheme to cover-up the greater hoax regarding all of our measures. Keep an open mind, and have a look at the evidence that compels me to reach this conclusion. The equation below reads: 2.0 “units” are to 1.0 millimeter, as 2.0 “units” minus .4125 “unit” is to 1.0 inchmeasure. “Inchmeasure” is my terminology for what otherwise is known as (1/32)”. The inchmeasure (im) is to the customary system as the millimeter (mm) is to the metric system. Believe it or not, the simple equation above, which is wholly predicated on a “mysterious” .4125 unit, perfectly resolves the conversion between the lengths of present humanities’ two fundamental units of measurement. Let’s set up the equation and perform a simple “cross-multiplication”. Insert (1/32)” for (im). Then see for yourself that this is indeed absolutely true! The conversion factor of exactly 25.4 millimeters per inch, resolving the commensuration between the two systems of length measurement, began to be adopted by various countries in the early 1930s. The decision to “round-off” the many different nation’s various versions of 25.399? ?… to an even 25.4 millimeters was an agreement by “acclamation”, and not the conclusion of any new mathematical discovery. The U.S. and British finally legislated their compliance to this standard in 1959. It remains the conversion factor for all nations to this day. Let’s look at what they actually agreed to, regardless of the process by which it was determined. This means that (2.0 units − .4125 unit) is exactly equal to 1/32nd inch if the length of 2.0 units exactly equals 1.0 millimeter. Below, the same line is divided into 254 units on top (mm), and underneath into 320 units (im). Further investigation shows that 127 difference measures equal 1.03125”; or, (33/32)”. And of course, 128 equal 1.0393700…”, which is 1.0” plus 1.0 mm. And who could have predicted that 480 units or increments of a [127 X 128] quantity of difference measures would add up to exactly 1.0 mile? The quantity [127 X 128] is written that way because it reflects a geometric pattern or arrangement familiar to that already seen in some of the previously exposed geometries defining measures of weight and volume. In this case, this quantity is modeled by a square grid having 127 units/side with one additional course of 127 units added to one edge. This quantity is modeled below along with several others that were exposed in earlier chapters. Note; The 480 multiplier is a quantity analogous to the 480 grains in 1.0 ounce troy and the 480 chains delineating the edge-length of a township grid. So, as it has been easily demonstrated by the simple previous mathematics, that only a (now very familiar to readers of previous chapters) .4125 quantity distinguishes modern humanities two systems of measurement. Both systems of weight standards, in their entirety, can now be constructed from this simple 27 mg. cube. 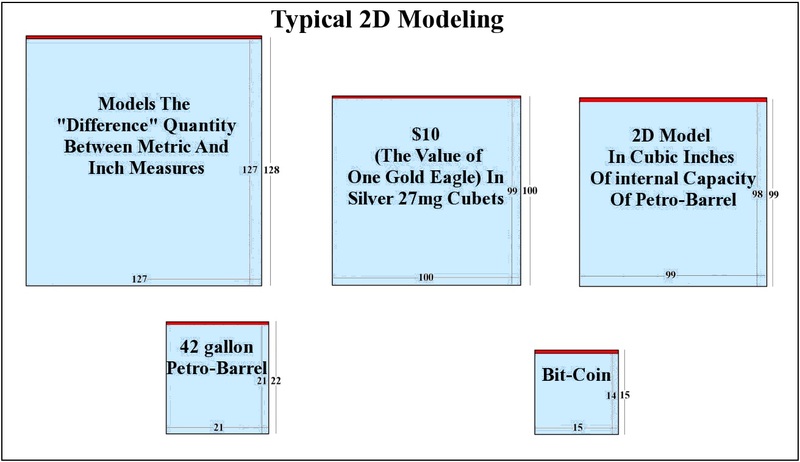 There is another cube that is very revealing, as it provides more unequivocal evidence showing the direct geometric connection between America’s gold and silver coinage weights and both systems based on the gram and the grain. Let’s start with “quanta-sizing” this cube by having its’ surface area measuring 1543.235… square units (which is clearly a 102 powering of 15.43235…, or the number of grains in 1.0 gram). The edge-length of this cube is 16.03764… and its’ volume is 4124.977… cubic units. Wow! What a coincidence. By starting with the number of grains in one gram (times 102) as the cube’s surface area, its’ volume becomes the number of grains in 10 American silver dollar coins: 4125 to be exact. And its’ 16.03764… edge-length (as grams) is the weight of the pure gold content in America’s 10 dollar gold coin , the eagle. In the 1792 Coinage Act, it was expressed as 247.5 grains, which is interesting, since 247.5 as a cube’s surface makes each of its’ 6 faces 41.25 square units. And remember, in 1792 the French were supposedly still trying to determine what a meter was, let alone know the weight of a gram to the tolerance of this 21st century! If the cube is re-sized so that the surface area is the number of grains in just 1.0 gram, Then its’ volume becomes 4.125. The next power of this cube is eight of them together as one cube. This cube’s volume is 33 units. So now we know that a cube with a volume of 33 units leads directly to eight geometric sub-units with each having surface areas measuring 15.43235… square units. But there is something else about a cube this size that indicates even Nature favors this quanta-size-ation. The equation above can be interpreted as saying that: “the relationship between a grain and a gram is the same as that between a quantity of 648 and 10,000”. In the illuminati’s system of weight measures based on the 27 mg. cubets, 648 cubets (in perfect geometric arrangements) has the weight of 270 grains, the eagle’s gross weight. None of this is “coincidence” . . . and shortly, we will return to the gram and grain. But first we should continue exploring the geometric roots of the lineal or length components of the meter measure (mm) and the inch measure (im). In the previous chapter on the Measures of Land, we saw what happens when geometry divides the volume of 1.0 surface unit in the form sphere into two new spheres. Remember, the volume of this sphere is .09403159… so the volume of each new sphere (made from the original’s volume) is .047015799… In this sphere’s transformation by division, one-half of the original sphere’s surface area (0.5000…) is likewise imparted to each new sphere. But we saw that this is not enough. A sphere with a .047015799… volume has a .629960526…surface area. Thus each of the two new spheres is missing a .129960526 portion of 1.0 unit of surface. We saw that this specific quantity of missing surface area is a geometric constant because regardless of whatever shape or form that the 1.0 surface unit assumes, if it divides its volume into two new forms, identical to the original form, each will be in need of an additional .129960526… surface unit. The total amount of surface area required to cover the two ½ -volume-unit spheres after the transformation is 1.259921050… units. Note the similar aspects of the last two equations above, and what they are describing. Each one starts with a square, subdivided into 10,000 sub-unit squares. The top most equation, and its “difference” quantity as a measure of the amount of acreage removed from its square, leaves the perfect 640 acre square mile as its remainder. And the lower equation (immediately above this paragraph) starts with a square subdivided into 10,000 sub-unit squares and then perfectly describes in square “inches”, one hectare; a land parcel 100 “meters” by 100 “meters”. The first equation shows the degree to which the quantity 27 commensurates metric measures with inch measures (99.99% perfect!). and the second equation perfectly describes one square chain (or 1.0 acre / 10), again exposing the quantity 27 along side a 4.125 unit as being at the heart of land measures. This next very simple equation uses powers of the same constants found in the two equations immediately above (27 and 640). It reveals the mathematics showing exactly how the illuminati (in the late 14th century) designed the transition from the ancient Roman gallon of 216 cubic inches to the modern gallon of 231 cubic inches. Several examples back we began to segway into the gram and grain, the measures of weight associated with the two different systems of modern measurement. History clearly and indisputably shows that the metric system’s unit of weight, its gram, is derived from a unit of length (1.0 centimeter). The weight of pure water contained within the volume of a cube having this edge-length is the gram. On the other hand, again according to history, the grain’s origin is not based on the length or size of any geometric unit, but instead literally on the weight of natural seeds, or “grains” . . . particularly wheat, barley, carob, and peas. Only much later did various kingdoms and empires create physical standards in metal, allegedly based on the weight of the grains. Since weight is a property of volume, and not a property of surface area, the geometric unit (in this system of transformational geometry) begins with 1.0 unit of volume in the form of a perfect sphere. The reader should remember and reference the image on the first page of the chapter on Measures of Land, where the naked spherical volume unit sits atop its own 1.0 unit of surface area rendered into a square. This same image, but this time quantified by the 1.0 unit being assigned to the spherical volume instead of its surface area, is where geometry gives birth to gra(mm) and gra(im). The name that the illuminati chose to call this 1.0 spherical volume unit of weight is the “gram”. In geometry, volumes can equal relative weights if in the given system the volumes of all of the forms are comprised of the same substance. So any number of these spherical units, if of the same substance, will have the same weight . . . 1.0 gram. And because two of these spherical weight units are required at minimum for any notion of “balance” to exist, the geometry of the gram and the grain begins with not one, but 2.0 grams in the form of perfect spheres. Spherical units each weighing 1.0 gram is what quantifies this first system of weight. What I mean by “first” is literally being the older of the two systems. Of course, this is another historical anachronism; but after all, that’s why they called it a “gram” . . . as in “grampa and gramma”. Regardless of which one really came first, the second system, quantified in grains, is structured on the exact geometric antithesis of the first system’s spherical form. This is a regular tetrahedron. This tetrahedron is so scaled that it is equal to the “face value” of the 2.0 grams. This means that the surface area of the tetrahedron, literally its “face”, is equal to the surface areas of the two spherical gram units. These geometric forms are depicted in the photograph on the following page. The combined surface area of the two spheres is equal to the surface area of the tetrahedron. 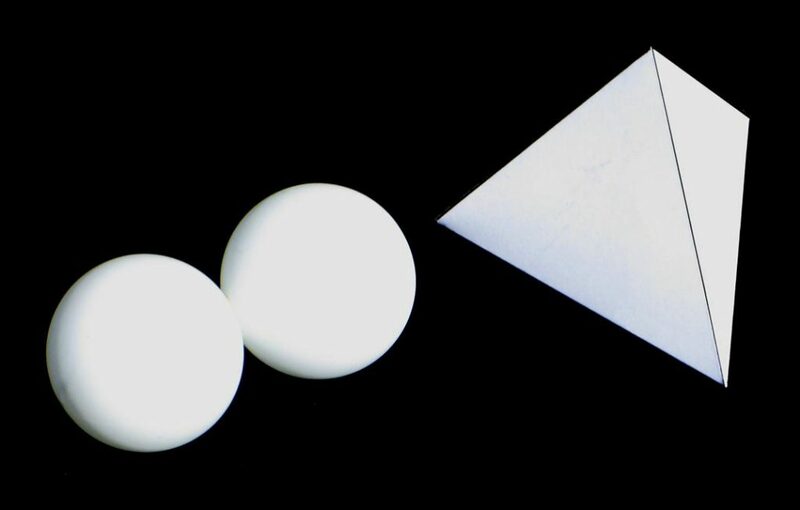 If each sphere is 1.0 “gram”, the tetrahedron is 1.0 “pence”. How do we know this? tetrahedron. Ultimately, we want to know how many grains are in the volume of the tetrahedron. 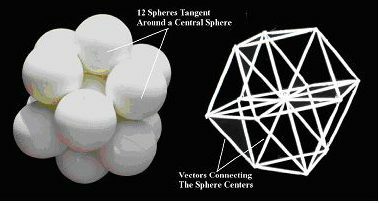 We already know each sphere is 1.0 gram, and that their two surfaces combined equals the surface of the tetrahedron. That’s all the information we need to answer the above question, and more. The first task is to find the surface area of one spherical gram unit. Here again it is important to understand that in the eyes of geometry “the unit”, and the “name” of that unit, creates or becomes the measuring rod. For example, if instead of grams each of the two spheres was a cubic “foot”, then we would calculate their surfaces in units of “square feet”; or if cubic “meters”, then “square meters”, and so on. So the only difference by calling them grams is that our measuring rod is in “gram based” units. The surface area of any sphere that is defined by having its volume equal to 1.0 cubic “any name will do” is 4.835975… square “any name will do”; which is also (36π)1/3. So the surface area of the tetrahedron in square “gram-based” units is 9.671951… Now from this we can calculate its volume and find it to equal 1.5551203… grams. . . and/or 23.999173… grains. This is 24 grains to better than a 99.9965…% approach to perfection! In British history going back to the end of the “dark ages”, 24 grains was itself a “unit”. The “name” of this “unit” back then, and to this day, is 1.0 pence. So referring back to the previous photo, if the two spheres on the left are each 1.0 gram, then the tetrahedron on the right is 1.0 pence. While the gram subdivides only into parts or powers of itself, such as tenths, hundredths, thousandths (milligrams), etc., the pence naturally subdivides into 24 equal “units” with each one equal to 1.0 grain. This is because the form of the tetrahedron, which represents the pence in this geometry, naturally subdivides its internal volume into 24 equal volume irregular tetrahedronal units. The photograph above exposes the tetrahedron’s “natural” internal sub-divisioning. Over three and a half decades have pasted since I first learned about this geometry studying Buckminster Fuller’s monumental work titled Synergetics. He named these sub-units “A Quanta Modules”. Many years ago, I had a special moment involving Dr. Fuller that someday I hope to share with others. It forever changed my life. But this I can say now, unequivocally; without Dr. Fuller’s creativity and genius this entire manuscript you are presently reading could not have been written. 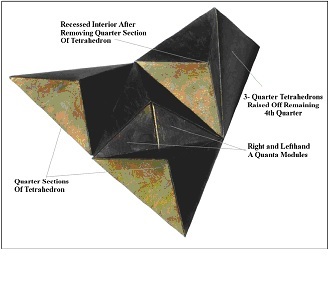 In the photograph above, the tetrahedron has been “quartered” to its center point and one face-section-quarter has been exposed along with two sub-unit irregular tetrahedrons, a right and left handed version. There are two other pairs that have been left attached. (So as not to be confused, the two-quarter sections indicated at the lower left are the same quarter sections attached to a third one, as indicated in the upper right.) All of these reduce to “A Quanta Modules” and are of the exact same volume. Dissected in this manner, the entire tetrahedron is reduced into its 24 constituent parts. These 24 grains are derived from the same surface area as are the two spherical grams. This is the “pennyweight” of old. It is 1/20 of a troy ounce; but more importantly, 1/20 is “5” hundredths of a troy ounce. It is from pen(ta), the Greek word for 5, that gave its name to this unit of weight . And because of its role throughout history as a fundamental weight measure and money unit, later came the Latin word “pendare”, meaning to hang, weigh or pay . . . which led much later to such words as pension, pendulum, pendant, penance, penny, and many more. To the illuminati, this became the “money particle”. This pence or pennyweight built the coinage on both sides of the Atlantic. In England by the end of the thirteenth century it was well established that twelve of these weights equaled one “shilling”, twenty shillings made a “pound” (troy). Of course, historically at that time the “gram” did not exist, and the only unit of measure was the “grain”. And precisely 24 grains equaled 1.0 pence. Our geometrically derived pence, at 1.5551203024…grams equals 23.999173…grains and did actually exist, not only way back then, but eternally as an ideal geometric form. And its weight is 24 grains, at least to a 0.99996… fineness in degree of perfection. The “illuminated” among the ancients probably knew what Dr. R. Buckminster Fuller re-discovered last century: that a regular tetrahedron naturally subdivides into 24 equal volume irregular tetrahedra. This money particle’s natural geometrical sub-divisions of irregular, long pointy tetrahedrons, when separated and loose in numbers actually appear to closely resemble “grains” of wheat or barley. Whoever designed the pence from the combined surfaces of two 1.0 gram units in the form of two spheres, also knew that perfect spheres of uniform size and weight were far superior to grains of wheat or barley for use as fundamental units from which a system of weights is built. No matter how close in weight and size, cereal “grains” could never even approach the perfect uniformity of idealized geometric spheres. And of course the geometers of old were also well aware that the sphere was geometry’s choice for the most efficient packaging of volume, since it contains the most volume using the least surface area compared to any other geometric form. They also knew the difference between the geometry at work in a bushel full of cereal grains compared to that within one full of comparable sized uniform spheres. By connecting with lines the centers of mass of each “unit”, grains in one bushel and spheres in the other, two very different geometries are revealed. The cereal grains create an irregular and mostly chaotic matrix. In contrast, in the bushel of spheres, each is surrounded by and perfectly tangent to 12 other spheres. Connecting the centers of the spheres creates what Dr. Fuller called an “isotropic vector matrix”, i.e. vectors or lines everywhere the same length. Around any point within that matrix geometry accommodates one vertex from exactly eight tetrahedra and six octahedra. These are unobstructed spatial domains created within the individual confines of line sets. These two commensurate geometric regular polyhedrons both share identical face triangles, but the octahedron is four times the volume of the tetrahedron. Geometrically speaking, the matrix formed in the bushel of spheres is seen to be full of nothing but tetrahedronal and octahedronal spatial domains, with no voids in between. The eight individual triangular faces of each octahedron is in turn one face of each of eight adjacent tetrahedrons. For every eight tetrahedrons there are three octahedrons occupying any given space. The entire bushel within, indeed all of space itself, could be filled completely using volume units in the shape of these two regular polyhedrons. But this natural geometric sub-dividing of space itself does not end here. It comes full circle back to the original tetrahedronal form of the pence and its composition of 24 “grain”-like “A Quanta Modules”. If these be the sub-units within each of the tetrahedra within an isotropic vector matrix, then the adjacent octahedra, which share faces triangles with the tetrahedra, can likewise each themselves be subdivided internally into 24 “A Quanta Modules”. Another way of looking at this is by imagining each of the tetrahedra within the matrix being incased by another ¼ tetrahedron from adjacent octahedrons on each of their four faces. This results in convex clusters of 48 A Quanta Modules (modeled on the right in the photograph below). 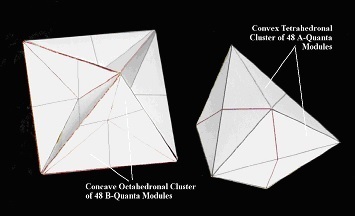 What is left remaining within each octahedron is a concave cluster of 48 (what Dr. Fuller called) “B Quanta Modules” (modeled on the left in the photo above). 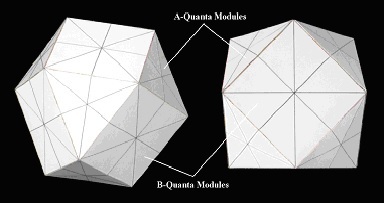 The 48 “A” and “B” Quanta Modules comprising each of the forms are of identical volume. Each module is equal to one “grain” of the 24 grain tetrahedronal “pence” (derived from the surfaces, or “face value”, of two spherical “gram” units). That they are of equal volumes is easy to demonstrate. Divide the octahedron into eighths by cleaving it through its three square equatorial planes. Since the octahedron is four times the volume of the tetrahedron each 1/8th octahedron equals ½ a tetrahedron’s volume. 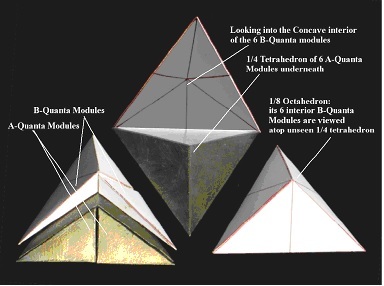 If we remove the ¼ tetrahedron from the base of the 1/8th octahedron we are left with a volume equal to the ¼ tetrahedron but in the form of six “B Quanta Modules”. The 1/8th octahedron is depicted face-down on the lower right in the previous photograph. The two forms in the middle show the ¼ tetrahedron within resting tangent to one edge of a now tilted back assembly of B-Quanta Modules (exposing its concave interior). The assemblage of forms in the lower left corner show how four of the 6 B-Quanta Modules embrace a cluster of 6 A-Quanta Modules within to form together as the 1/8th octahedron. Now when the geometer looks into the bushel it is possible to see nothing but neatly arranged clusters of 48.0 identically volumed modules. They are of two types: convex tetrahedra and concave octahedra. They are interwoven together, and like a three dimensional fabric they fill all of space, leaving no voids. This unusual complementary geometry does not lend to repacking very easily. For this the geometers used another natural arrangement out of a combination of these two forms. These are truncated cubical clusters, with each containing a blend of 480 A and B-Quanta Modules. Archimedes called this shape the “cuboctahedron”; and later, Buckminster Fuller coined the term “vector-equilibrium” for this very special geometric solid. I am confident that the illuminati’s geometers chose this as model for their unit of weight measure, and that those at the time of its inception named it the “Troy Ounce” of 480 “grains”. A few paragraphs back, when looking into the bushel with the matrix of connected sphere centers we saw a lineal frame work isolating individual tetrahedronal and octahedronal spatial domains. When these were again subdivided into grain-like modules with each equal in volume to every other, and a spatial domain unto itself, we saw another arrangement emerge from these clusters of 48.0 A and B Quanta modules. Remember, around every sphere center is a vertex from eight tetrahedra and six octahedra. The octahedra are naturally cleaved in half by the planes of the B Quanta modules of which it is composed within. Thus around any given vertex or sphere center a “natural unit” is formed out of the eight tetrahedra and six “one-half” octahedra. The resulting shape is a cube with its eight corners truncated (cleaved) from the mid-points of its edges. The entirety of space can be filled with these cuboctahedronal blocks with each containing 480 A and B Quanta Modules (336 A, and 144 B). The parallels above between the natural “geometry of form” and the actual systems of weights and measures conform to a 0.99996 fineness. In terms of “models”, the tetrahedron with its 24 natural subdivisions, and the cuboctahedron made from these tetrahedra and composed of 480 identical units, are both perfect models for the “pence” and “troy ounce” respectively.